Yippey! The week is almost over. While, I sit in my unnatural habitat and be a code monkey, oops that’s M’s job. M is getting ready for a big move to a new city for a new job, how exciting! 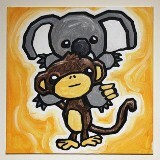 Monkey has to go, and Koala is sad, but alas, c’est la vie!